For most of the past three decades, George Weah has been best known as a free-scoring footballing icon. But for the last 100 days, his actions as Liberia’s new president have been the ones grabbing the headlines. Weah came to power on 22 January after defeating the then vice-president Joseph Boakai in the election run-off with 61.5%. Running on a platform of comprehensive change, the 51-year-old senator won the support of many young Liberians and brought the Unity party’s 12-year rule to a close. Weah promised that with his Coalition for Democratic Change (CDC) party in office he would reform the economy, combat corruption and nepotism, and usher in a new hopeful era for Liberia. How is he faring 100 days in? Getting the ball rolling on the economy? In his campaign, Weah vowed to run a “pro-poor” government and claimed that “transforming the lives of all Liberians” would be the core focus of his presidency. He promised to turn around an economy still struggling to recover following the 2014-15 Ebola crisis and make Liberia an attractive place to do business. In order to tackle youth unemployment, he said he would boost funding for education to improve academic institutions and vocational courses. In a symbolic act, the president announced he was cutting his own salary by 25% and fulfilled his campaign promise to waive exam fees for around 34,000 secondary school students. 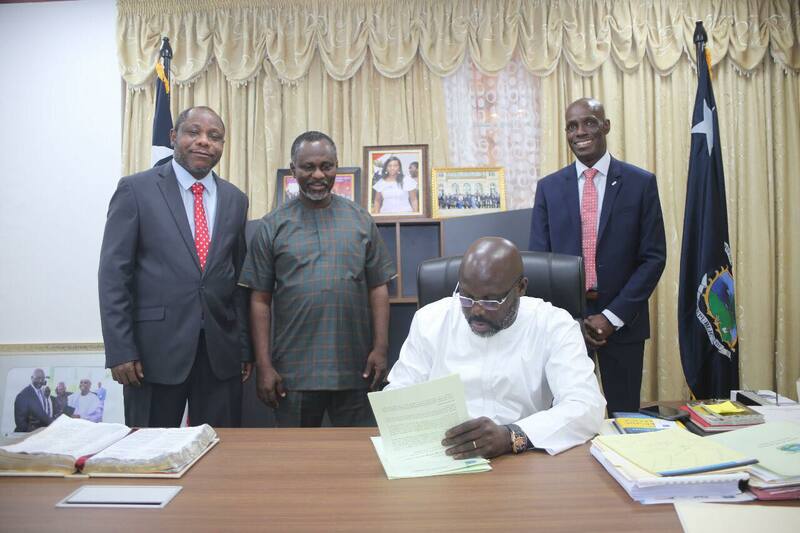 The government announced plans to provide a digital registration system and free wifi at the University of Liberia. It vowed to pay the salaries of hundreds of teachers and fill vacant positions. Weah also announced some ambitious longer-term plans. For example, he got the ball rolling on the construction of a military hospital, setting aside $200,000 for a feasibility study and mandating that half the funding for the hospital be made available immediately. With only 10% of Liberia’s roads paved, he negotiated a $536 million memorandum of understanding with an Asian conglomerate to build a coastal highway. And the government revealed the upcoming construction of a modern convention centre in the capital Monrovia to be financed by India. These plans have raised concerns among critics. Some, for example, have suggested that money would be better spent on existing medical facilities than on a new hospital; in April, Liberia’s chief medical officer said that several services would have to be shut down due to a lack of funding. Others have questioned whether Liberia can afford to borrow hundreds of millions for infrastructure projects when debt levels are already high. Meanwhile, yet others have asked whether these priorities are truly “pro-poor” and emphasised more pressing concerns that could have, for example, targeted slums and rural communities. An own goal on corruption? Given his relatively untainted reputation, many believe Weah has the credibility to tackle this problem. But soon after his inauguration, the new president started making worrying missteps. His choice for Justice Minister, for example, turned out to have previously lost his legal licence after misappropriating $25,000 from a client, leading Weah to withdraw the nomination. The president also came under fire when he replaced the head of the secretariat for the Liberia Extractive Industries Transparency Initiative. Along with opposition figures and the media, the transparency watchdog Global Witness insisted that the president is not authorised to make such an appointment and warned that the move threatened to undermine the critical anti-corruption body’s independence. Further eyebrows were raised when it emerged that three of Weah’s brothers had been employed at the Freeport of Monrovia. They were recruited by the National Port Authority’s acting managing director Cecelia Cuffy-Brown, a Weah appointee. Not only was this reminiscent of former president Sirleaf’s appointments of family members to key positions, but an investigation by FrontPageAfrica suggested that the new recruits were being paid four times the salaries of even the heads of their departments. In the election, Weah vowed to bring change how Liberia is governed, including through his appointments. Since coming to office, however, he has learnt that this can be a difficult and risky strategy to enact. The president’s choice of some young newcomers for government positions, for example, has faced criticism. “When the president appoints an expelled student of the University of Liberia to serve as Assistant Minister of Agriculture knowing fully well that this ministry is a key pillar of the president’s proposed pro-poor agenda in Liberia, it tells you where we are headed”, says political analyst Sampson Doe. Weah also faces another tricky challenge in picking his team. In the election, he chose Jewel Howard-Taylor, the ex-wife of former president and convicted war criminal Charles Taylor, to be his running mate. She attracted support from followers of the former leader, but also drew domestic and international criticism for suggesting a Weah government would continue Taylor’s legacy. It is unclear what influence the new vice-president wields within the administration, but Weah has notably recruited several allies of the former warlord to government positions. Charles Bright, a key figure in the civil war and former finance minister under President Taylor, for example, has been given sweeping powers as an economic adviser to Weah that have led some to refer to Bright as “effectively the new Prime Minister”. Emmanuel Shaw, another former Taylor associate and finance minister, was appointed as a special advisor. He has faced numerous corruption allegations and is perhaps best remembered in Liberia for engineering the purchase of an expensive jet under the regime of Samuel Doe, which he then allegedly sold before escaping to South Africa. Weah supporters have also been disappointed by the new government’s stance on the 2010 Truth and Reconciliation Commission (TRC) report. The ruling CDC had promised to implement the recommendations of this investigation into 14 years of civil conflict. These included banning several individuals from public office and making perpetrators of human rights violations pay reparations to victims. Yet once in office, the CDC said it cannot follow the recommendations due to a fragile security situation. President Weah’s first 100 days in office may have been a rude awakening for the former football star. He has already faced some high-footed challenges and experienced some slip-ups in pursuing his ambitious agenda. However, pundits say that euphoria is still high amongst CDC supporters. A few difficult months in, Weah may be a little bruised but he remains a beacon of hope for many young Liberians disillusioned by the previous era.